In “The Thief,” the Porter family plans a surprise birthday party for Christa. 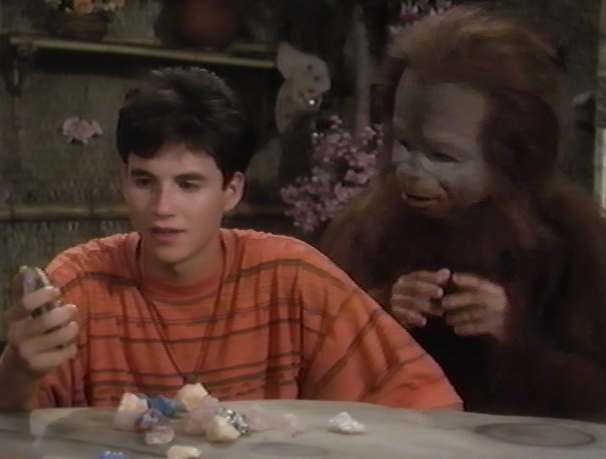 In order to impress the jungle girl, Kevin plans to make her a necklace. He steals several gems from a pterodactyl nest near a mountaintop. When the treehouse is ransacked, and the gems turn up missing, Kevin blames Stink, who had shown an interest in the jewels. Although Stink maintains his innocence, Kevin is cruel to him, and calls him a thief. 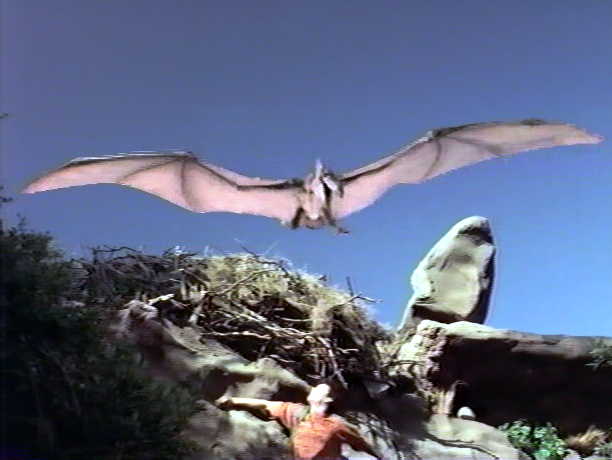 In time, the real culprit is identified: the pterodactyl. “The Thief” is an episode of the Land of the Lost (1991 – 1992) remake that sometimes plays like an episode of a bad 1990s family sitcom, with one character accusing another of doing something bad, and then hurt feelings generated all around. The message, telegraphed early and often is -- as the Super Friends might note at this juncture -- “don’t jump to conclusions” about people or their actions. It’s a good lesson (and this is a kid’s show so that’s fine…), but this episode does feel a bit heavy-handed. What makes the episode somewhat more interesting -- if not necessarily good -- is Robert Gavin’s high-energy portrayal of Kevin Porter. He plays Kevin in “The Thief” not merely as wrong, but as downright brutal. Kevin comes across so angry -- and as such a jerk -- that I was reminded of Dirk Diggler stoned on cocaine in Boogie Nights (1997). Seriously, Kevin transmits not only as angry, but as downright psychotic. He treats Stink terribly, and it’s to Stink’s credit that he forgives Kevin at all. I think the point of “The Thief” is that, for we all say and do things that we regret -- I already regret the Dirk Diggler joke in the above paragraph, for instance -- but Kevin is so vehement and horrible in both act and deed, that the appropriate moral take-away gets lost. And besides, the episode never really gets to the idea of who the real “thief” actually is here. It was Kevin himself, who stole the gems from the pterodactyl nest, and put this whole sad affair into motion. The “thief” of the episode’s title is Porter! It is true however, that Kevin is repentant about his behavior in the end. It would have been even better, though, if he noted that he was at fault, from start to finish. He stole the gems, he accused the wrong person, he acted like a jerk, and he created the whole situation. Perhaps the lesson here, then, is forgiving people not just when they make mistakes, but when they compound that mistake and it snowballs into something bigger. This episode just reminds how better the original '74 LOTL series with the Marshall family was.